Our Bylaws specify that QED membership is limited to a total not exceeding 65 Active Members, and the Membership shall be balanced among representatives of the professions, business, industry and military. New Members are recruited by all Members whenever a vacancy occurs. A prospective New Member is required to attend at least two meetings as a guest before being considered for membership. New Members are recommended in writing by one or more Members to the Executive Committee, which shall evaluate the candidate(s) on their ability to bring valuable skills and presence to QED, and in regard to the need to maintain a balance among representatives of the professions, business, industry and the military. A ballot for the recommended candidate(s) is then circulated to the entire membership for a vote. Voting on new Members is by secret ballot, and every Active Member shall have an opportunity to vote for each recommended candidate. No candidate shall be elected to Membership except by the affirmative vote of at least two-thirds of the Active Membership. Members are be expected to attend meetings. Inability to attend a minimum of five regular meetings within a 12-month period shall be considered grounds for termination of membership. The Executive Committee is empowered to enforce this provision. EMERITUS – Those who subscribe to the purposes of QED and having served as Active Members, request the Executive Committee to approve their change of status to Emeritus because they are unable to participate actively in QED. Such Members shall have all other rights and privileges possessed by Active Members, except for voting rights. Harmony and fellowship among the members is an important core value of our group. 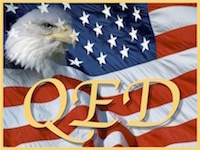 To see a current list of QED Members, please CLICK HERE. A single annual dues, paid semi-annually by each Active Member, shall be fixed from time to time by the Members to cover all the expenses of administration, the cost of meeting lunches and bar drinks, the speaker’s luncheon, and the Summer and Winter QED parties for Active Members and their spouses or guests. Emeritus Members will normally be assessed the cost of their attending a luncheon meeting or special social event, unless waived by the Executive Committee. Other invited guests of QED, will normally have their costs paid for by their Member sponsors, unless waived by the Executive Committee.